Gifts from the Pirates: "Well, one day a mommy spider and a daddy spider fell very much in love..."
"Well, one day a mommy spider and a daddy spider fell very much in love..."
To quote Mrs M "what have you created?". 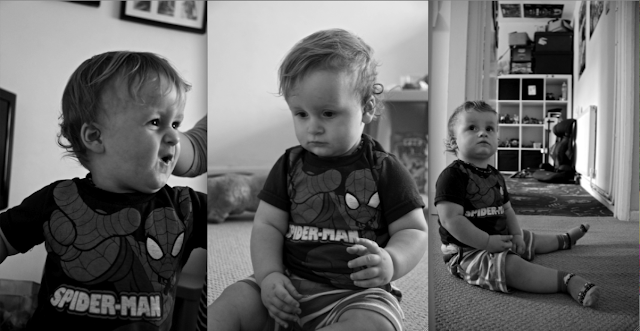 It seems that our little cutie has become Spider-man obsessed and it makes me very proud. 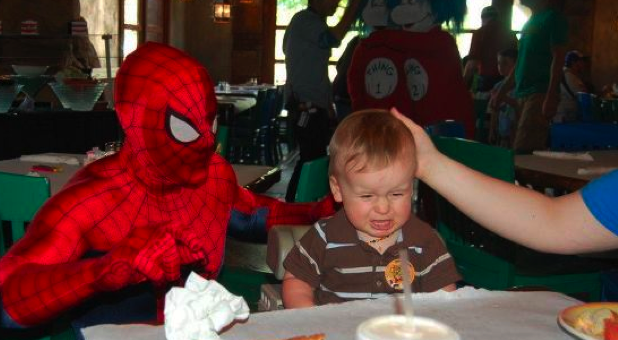 It was about 2 weeks after we got back from Florida that the obsession began which is a shame as while we were there we met spider-man and Opeie wasn't very impressed. If it had just been a couple of weeks later he would have been a very excited boy. We've started looking at holidays to the US again so I'm sure he will meet his hero very soon. 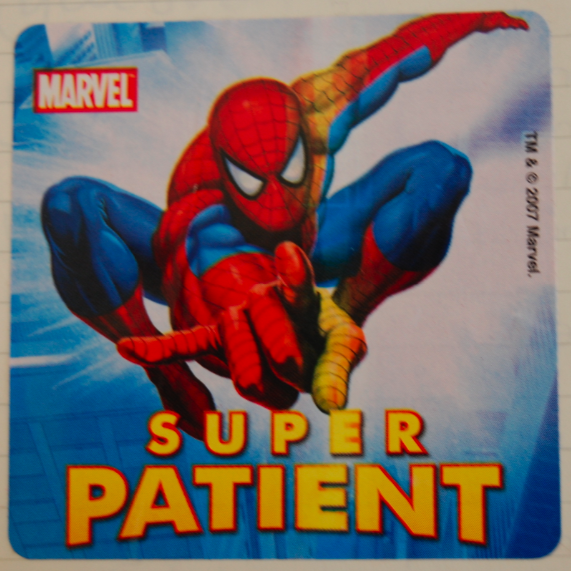 As you can probably imagine from reading the blog there is quite a bit of Spider-man merchendise in the house but a large percentage of that are things that Opeie has seen while we have been out and about and has decided it is a must have item. We cant seem to go to boots without coming back with a Spider-man toothbrush (which to be fair i don't really mind, because of this Opeie loves having his teeth brushed which i believe is quite unheard of in a 17 month old). It was Mrs M's idea to write a post about all the Spider-man stuff and one day i came home and they had found all the things they could that had Spider-Man on and it was all piled up in the lounge. I think Opeie was in Super hero heaven. wherever we are Opeie will always spot a Spider-man item no matter how small or insignificant it is. One day at home he was desperately reaching up into the air and we couldnt work out what it was he was after. After getting practically everything down to see what it was i lifted him up and carried him over, turns out all he was after was a sticker that the Dentist had given to Seth on his last check up. Even as im writing this he is desperately trying to get at the computer because he can see the pictures of himself surrounded by spidey. Weve had to come home from Asda on more than one occasion with their gift cards because they've got the wall crawlers face on. Action figures, shoes, cuddley toys, balls, books, bags, drinking flasks, Pez dispensers, Opeie doesnt care what it is he must have it. Mrs M's mom and dad came round a few weeks ago and had brought the boys a Spider-man rubber ring for the summer, Opeie proceeded to crawl about with it around his waist for most of the following week, at one point i walked into Seths room and he had the ring round his waist and was wearing Seths Spider-Man bike helmet (clearly he's going to be a bit of a fashion disaster like daddy was back in the day). He's quite a snob when it comes to all the other comic characters too, a week or so ago i got out all the loose Super Hero Squad figures that i have been collecting him to play with, and what did he do.........? .......he seperated the 4 Spider-Man figures from the rest of the group. Obviously the web head is far to good to be associating himself with that bunch of scum bags. He loves the chunky figures but I'm starting to think i might start a collection of all the more grown up Spider-Man figures for him for when he is older as there are probably hundreds of variations. I really love that he is so into something that I'm into already and in return he has got me into Yo Gabba Gabba. Most days he's got a different Spider-Man T-shirt on which i don't think Mrs M is to pleased about but that's what happens when i dress him, plus i like the thought of him looking like a mini me because he is in fact a mini me. Ill be writing a post about the boys T-shirts soon, i thought about it 2 weeks ago when i saw them all hanging on the washing line. (Thanks again Chris [http://gingerjamphoto.com/] for the great pic's). I'm so proud of the way he is turning out and not just the obsessing of super hero's although it is a bonus. We have 2 very beautiful little gentlemen and everyone that meets them adores them. What more could you ask for? They are both very affectionate and always love lots of hugs and kisses and i wont lie me and Mrs M love dishing them out. Spider-Man is always going to be one of the main topics of conversation in the house, at least until the boys are teenagers anyway then god knows which way they will go. I may end up being Seth and Opeies weird comic book loving dad. Either way I'll always be Opeie and Seth's caring Dad who is happy to dedicate all his time to them and their beautiful mommy. Wow!!! Opeie sure does love Spidey!!!! he's a very very lucky boy.